Building a new inground pool is a big decision, and with the plethora of options out there, choosing the perfect pool can be overwhelming. At Green Acres Pool Place, we understand the investment you’re about to make, and our professionals walk with you throughout the entire project. We are dedicated to providing you with an exceptional and knowledgeable pool design and build process. It’s our job to help you make the best decision when it comes to outfitting your backyard with a custom gunite, vinyl liner or fiberglass pool. During your consultation, your Green Acres representative will walk you through the three different types of inground pools we offer and provide you with all of the necessary information to decide which one your backyard will benefit from most. 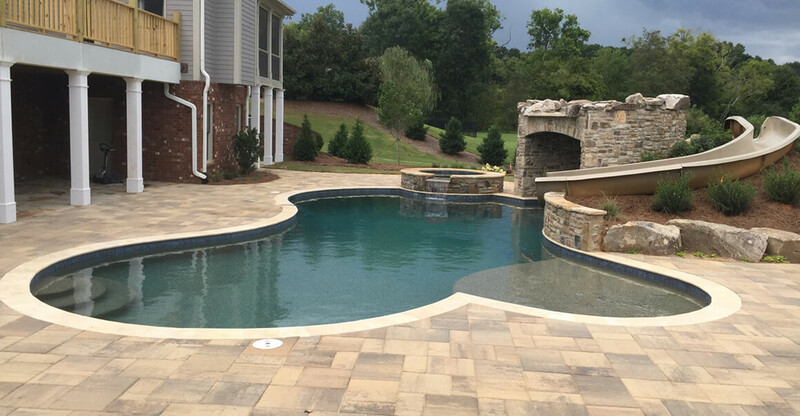 As the leading inground pool builder in Cartersville and the surrounding areas, we feel confident we’ll be able to design and build the perfect inground pool for your backyard space. From classic designs to more elaborate features, Green Acres can create what you’re looking for at an affordable price. Click on the tabs below to learn more about our gunite, fiberglass and vinyl liner options. Vinyl liner pools are one of the more popular choices for inground pool design because of their exquisite look combined with their lower upfront cost. At Green Acres, we carry the Latham brand of vinyl liners because we are confident they will bring long-lasting quality and character to your backyard. The vinyl liner pool systems offer a variety of shapes, sizes, liner patterns and accessories to choose from, allowing you to customize a backyard design that perfectly fits your personality. When you speak with your Green Acres design specialist, you can expect to be shown all of your options in an effort to figure out which quality product will work best for your backyard. Green Acres Pool Place is proud to offer Trilogy Fiberglass pools. Fiberglass pools offer many advantages over other types of pools. The installation process is much faster because they are factory-made, delivered to your home and inserted in the ground already assembled. The smooth and non-porous surface of a fiberglass pool is easy on your skin, prevents staining, and makes it harder for algae to grow. Thus they require less maintenance and save money with less chemical treatments. Fiberglass pools are available in a large assortment of shapes and sizes. LED lighting, waterfalls, heaters, automatic covers, and built-in benches, steps, and coves allow you to customize your fiberglass pool to fit your needs. Choose a timeless style that complements your backyard landscape. Gunite pools are considered to be the top-of-the-line option when it comes to inground pools. These pools can be built in any shape or design and offer superior strength in foundation. Gunite pools truly have no limits on creativity. At Green Acres, we can help make your dream pool a reality by using gunite material and giving you exactly the design you desire. 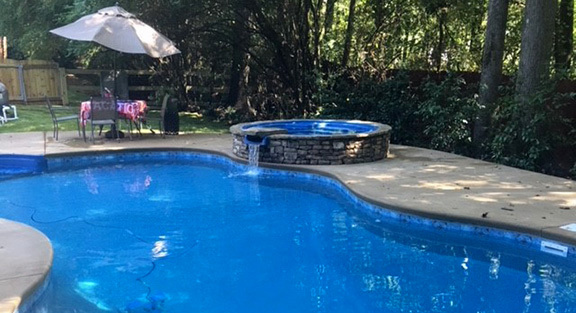 Pool owners often choose a gunite pool because special design features can be easily incorporated, such as sunken seating, tanning ledges and beach entries. The structural strength of these steel-rebar reinforced pools also allows for any number of water features, including waterfalls, slides and bubblers.